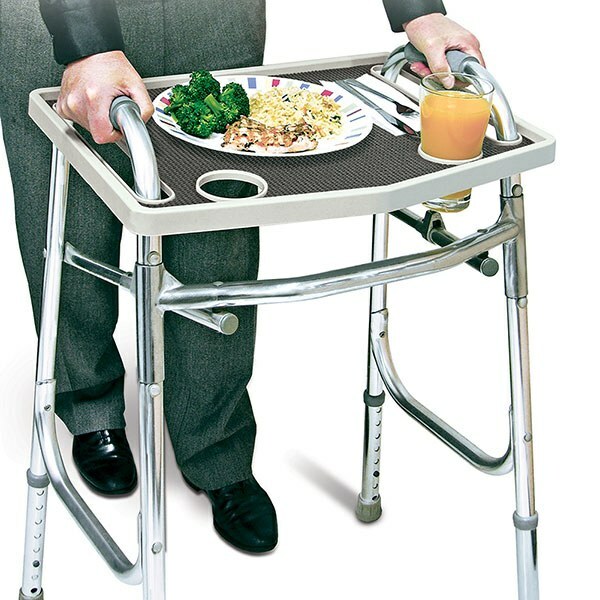 Turn any walker into a TV tray or carry all. Turn any walker into a TV tray or carry all. This walker tray has non-slip mat holds food and drink, crafts, books, anything you want to take on the go. Rubber grips help prevent sliding. Raised edges, 2 recessed cup holders. Slides over the handles of most standard walkers. Great for buffets and potlucks! Easy to clean plastic. 21" long x 16" wide x 1" high. Available in gray or red. NOTE: The walker is not included. Product attaches to your existing walker.